Former world chess champion Bobby Fischer has won a court injunction against his deportation from Japan. The court said he could stay in Japan until it ruled on his challenge to a deportation request from the US, a process which could take months. Mr Fischer is wanted in the US for violating international sanctions against Yugoslavia in 1992. The controversial player was detained in Japan while trying to travel to the Philippines on a revoked US passport. Mr Fischer has tried to fight his deportation by applying for political asylum in Japan and renouncing his US citizenship - both of which have been rejected by the Japanese courts. He also recently confirmed plans to marry a Japanese woman, Miyoko Watai, the head of the Japan Chess Association. In a statement, Mr Fischer's spokesman said his application to marry Ms Watai has received provisional acceptance by local authorities, the Associated Press reported. 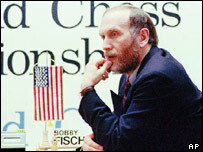 Mr Fischer has been on the run from the US authorities for more than a decade, after being accused of breaking international sanctions by visiting Yugoslavia to take part in a chess match in 1992. Before his detention, he had managed to live undetected in Japan for three years, sometimes travelling abroad. A brilliant but mercurial player, Bobby Fischer became a grandmaster at 15 and shot to fame in 1972 when he beat Boris Spassky of the then Soviet Union. He held the title of world chess champion until 1975, and resurfaced in Yugoslavia for the dramatic 1992 rematch against Mr Spassky. He won the game, but disappeared when the US authorities announced they wanted to prosecute him over the $3m he earned for playing, which Washington said violated US and United Nations bans on doing business in the country.